How to make your blog attractive to search engines? You need to create a quality content, they say. And what the “quality content” actually means? Here are 10 factors search engines pay attention to while indexing your blog. Matt Cutts, the former Google’s Head of search spam once said that “if you look at the PageRank of a page — how reputable we think a particular page or site is — the ability to spell correlates relatively well with that. So, the reputable sites tend to spell better and the sites that are lower PageRank, or very low PageRank, tend not to spell as well”. What to do? Check your content using Grammarly and dictionaries (like urbandictionary.com). Latent Semantic Indexing (LSI) is a method used by the crawlers to “understand” a general meaning of the website content. To help them and increase your positions use LSI phrases – words associated with the initial keyword. For example, you promote your website with the “Long Island” keyword. Just add to your content LSI words like “island”, “flats”, “hotels”, “New York” to show crawlers that you are promoting the hotel in New York, not the bar in London. Search tips. You can get it manually from Google autosuggest. To get more fast and accurate results use SE Ranking “Keyword Suggestion Tool” to automate this task. Google Keyword Planner Tool. See “Keyword Ideas” tab. Search engine recommendations. Check the section “Searches related to” below the search page of your query. Do you want your page to get the Google Answers box? You should focus on the content structure, then. It can also increase the content readability — and the chances that your potential customers will understand all the benefits of your product. What to do? Make sure that your text contains subtitles, paragraphs, lists and visual content. Search engines love the frequently updated content. And users too. Regular (and valuable, of course) content encourages them to come back to your site, which is good for ranking and loyalty. What to do? Analyze visitors’ involvement to find out the optimum frequency of publications for you. For example, Hubspot analysts researched that it is necessary to publish several posts a day to get more leads. Amit Argawal, founder of Labnol blog, figured out that 3-4 posts a day give the best results. Don’t forget to add the date to your publication. Google highlights it in the query, and users tend to follow the link with “fresh” information. Landing pages sell products, and blogs sell texts. The links to relevant content in the article are excellent cross-selling. The user gets even more useful information, and you increase your positions in the SERPs. The time the user spends browsing your website is an important signal for ranking. Customize bread crumbs for easy website navigation. After publishing a new article, add links to the earlier ones using LF (Low frequency) and MF (Mid-frequency) keywords. Add the block “Based on your selection, you may be interested in the following items” via your CMS, and manually add related articles. Video is the main trend of 2017. According to a new report from Cisco, by 2019, online video will be responsible for 80% of global Internet traffic. Replace your longreads with the video lessons. Use the video from YouTube. 20% of the SERPs are the video snippets. 70% of people are visual learners — that’s all you need to know about illustration importance. So let’s get down to it. The ideal ratio is 1 image per 1000 characters. For certain topics (for example, tourism) it’s better to use even more photos and videos. Image ALT is a great place where you can use the keywords that aren’t very suitable to the text (“hotel on the edge of the mountain in the Alps”). So you can get additional traffic from Google’s Images. Interesting content generates a discussion. Keep it going! It will help you improve site visibility and readers loyalty. Make commenting available through CMS setting or via Disqus widget. Respond to all comments and questions. One of the main challenges in blogging is to find interesting and relevant topics. There are several ways to discover your readers’ needs. Check Google Trends to find hot topics in a particular region or period (for seasonal topics). Find out the search volume index for every keyword on your topic, geographical information about search engine users, and the frequency your keyword appears in Google News. Monitor your competitor’s’ website content to be aware of their hot topics. 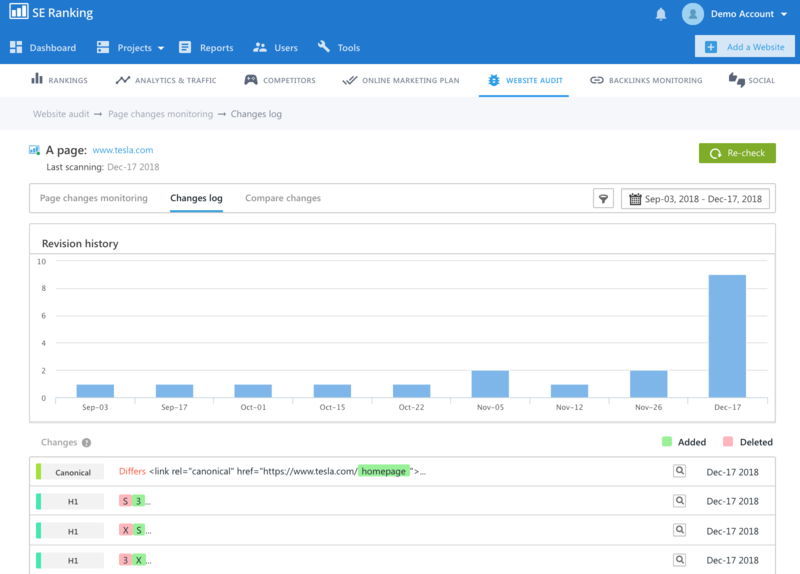 Use SE Ranking Page Change Monitoring to track all content changes on their pages. How can we define the quality of the content? Let’s begin from the bottom, and find how a poor-quality content affects your site. It’s worth looking at it and make necessary corrections to keep your readership happy. Track user engagement using Google Analytics. Find the point where your readers are dropping from the page, check their path and bounce rate. Analyze why they’re leaving, and take it into account when creating the content. Probably, the easiest way to ensure good rankings to your website is to start with the right template. Nowadays, the market is full of providers, who optimize their templates according to the latest search engine algorithms. Therefore, you can use a website builder solution to start your business and make sure that it will be on the top of search engine results. Such templates can already have clear content structure and all the necessary tags in the right places. There is also inner linking in header and footer sections, which can ensure that all of your website pages are strongly interconnected. And the top of the pie is a set of images, which are not oversized and make the pages load faster (and we all know Google loves it). These 10 recommendations will not take you to the TOP in a few days but become a good foundation for yielding tangible results in SEO and achieving the best ranking possible. Credible: Show your site’s credibility by using original research, citations, links, reviews, and testimonials. An author biography or testimonials from real customers can help boost your site’s trustworthiness and reputation. Thanks! Glad to hear you’ve found it useful!